Since the International Trade Administration came into existence more than 35 years ago, our core mission has been to advance the U.S. government's export and foreign direct investment agenda in order to support and create American jobs. With a staff of more than 2,200 people, which includes our trade and industry specialists in Washington, DC as well as our Commercial Diplomats in 108 U.S. cities and over 75 international markets, we work every day to fulfill that core mission. But the simple fact is that the strongest determinant of our success as an agency is the singular strength of the American business community. Another example is our future participation in this year's Hannover Messe, the world's largest industrial trade fair, taking place April 24-28 in Hannover, Germany. Attendees will find our U.S. Commercial Service staff ready to help by formulating business strategies, identifying promising markets, and scheduling meetings with buyers. (Click here to register your interest). 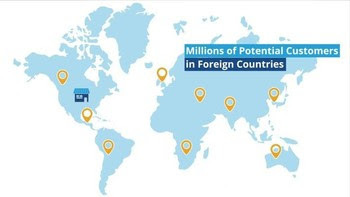 Foreign companies from all over the world look to set up operations in the U.S. because of the diversity, innovativeness, and productivity of the American workforce, which is why we currently hold the largest amount of foreign direct investment in the world today. We saw the proof when Fuyao Glass America, a subsidiary of the China-based Fuyao Group, opened the world's largest auto glass fabrication facility last October in Moraine, Ohio. The unparalleled strength of the U.S. workforce supports our efforts to attract foreign direct investment, which is carried out by our SelectUSA Program. SelectUSA's services include providing information, guidance and counseling to foreign businesses looking to come to the United States, as well as supporting U.S. based economic development organizations by providing market intelligence or in-person support to help lock that new deal. Since its inception, SelectUSA has facilitated more than $23 billion in investment, while retaining or creating tens of thousands of jobs. Another singular advantage comes from our travel and tourism industry, which happens to be our leading sector for services exports. And given our goal of welcoming 100 million visitors annually by 2021, this will require working to welcome more Chinese travelers to our country. 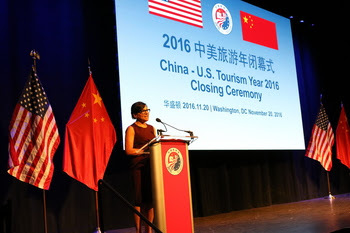 Since 2016 was the U.S.-China Year of Tourism, ITA worked on several projects to improve the experience for Chinese travelers, including producing a resource guide to help U.S. travel and tourism providers better serve Chinese travelers. Looking ahead, we will work with our Chinese counterparts to ensure there are ample air services to cater to increased demand for travel from China to the U.S.
Of course, none of this includes our day-to-day work to support American businesses. Whether it is providing webinars and videos on improving export prospects, awarding financial and technical assistance to help U.S. companies export, leading trade missions to connect businesses with prospective partners, or providing cutting edge market intelligence through our Country Commercial Guides. Thanks for everything you do to support our work and hence the American economy. We look forward to continuing to support American businesses and workers in this New Year. Are you one of many U.S. business owners that wants to begin exporting your product internationally, but are having trouble finding the right foreign buyers? Fortunately, the US Commercial Service has come to the rescue, releasing of a new set of Exporting Basics videos all about helping businesses like yours sell on an international level. Identifying and contacting international buyers is the next step toward achieving exporting success, so watch this new set of videos from the Exporting Basics video series and get those international sales today! The newest addition of videos is a 5-part set focused on providing information to help small US business identify, contact, and connect with foreign buyers—Check Out The Videos! 1-on-1 counseling with Lain America market experts at Trade Winds. After ten years of creating business success for hundreds of U.S. companies in promising markets around the world, I'm proud to announce that the Trade Winds forum and trade mission will head to Southeast Europe in October 2017. Our Commercial Service team will lead U.S. companies from across business sectors to meet with prospective business partners, government decision-makers, regional press outlets, and European market experts. Both Discover Global Markets: Advanced Manufacturing and HANNOVER MESSE can provide synergies to your export business in 2017. Manufacturers are always looking for synergies within their operations: when two things work together to deliver a result that's greater than their individual impact. Now, allow us at ITA help your company realize the synergy of participating in two very important events in 2017 to grow your international sales: Discover Global Markets: Advanced Manufacturing and HANNOVER MESSE. "International Trade Update" is published monthly by the U.S. Department of Commerce's International Trade Administration. For more information about the International Trade Administration, contact: Office of Public Affairs, International Trade Administration, 1401 Constitution Avenue NW, Washington, DC 20230. Tel. (202) 482-3809; on the Web: www.trade.gov.